A story-spinning initiative this year adds St. Norbert narratives to the nation’s largest oral-history archive. But, it’s making a resurgence at St. Norbert College through a partnership with StoryCorps, the oral history project that has touched hearts through the NPR podcast series – as well as through the treasure house of interviews available at the college’s own storycorps.org site. Students talking with other students about friendship and growth. Faculty reflecting on their time teaching together and meaningful moments in the classroom. Staff and students discussing experiences in service and how we thrive by helping others. Students from varying backgrounds revealing the hardships and challenges they face while transitioning into and out of college. Sharing the importance of communio, finding love in unexpected places and connecting to those around us. A college president, Class of 1990, reflecting on his journey home to St. Norbert after more than 25 years. These are just some of the stories that have been recorded by St. Norbert friends so far with the help of the Cassandra Voss Center (CVC) and the StoryCorps organization. When the CVC first launched its Spinning Stories campaign last fall, there was an initial and understandable hesitancy on the part of students, faculty, staff and others to provide personal tidbits and stories connected to their relationship with St. Norbert College. What do I even talk about? Why me? I don’t have anything important to say. But those questions didn’t prevent stories from being told. 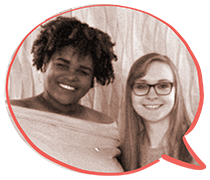 “So many participants felt like they didn’t have a story to share, but when they start recording they have these amazing, beautiful, poignant conversations,” says Lauren March ’17, this year’s AmeriCorps staffer at the CVC. Paige Bonner ’19 and Janie Janczakowski ’21 didn’t realize how connected they would feel discussing their time away from campus until they sat down together and unpacked each of their journeys in different parts of the world. Maria Sauer ’17 and Shannon Salter ’18 connected during a conversation about building community through service. Daniel Webster ’17 revealed that you still have a lot to learn about someone despite being friends for 20 years when he reflected on his conversations with Terrell Brantley ’20. Every story is worth sharing in some way – that’s the central part of the StoryCorps mission. A not-for-profit founded by radio producer Dave Isay, StoryCorps is well-known among oral-preservation projects. Its work promotes the value of listening and uses one-on-one conversation to help build a shared human experience. Through its efforts, the initiative hopes to create a more just and compassionate world by preserving and sharing stories of everyday people, one exchange at a time. You’ve likely heard a few of StoryCorps’ interviews featured on PBS as StoryCorps Shorts through the station’s POV series. These animated snippets highlight only a few of the thousands of stories the organization has gathered from people around the world since 2003. The Storycorps archive comprises one of the most extensive digital collections of recorded human voices. More than 75,000 interviews – including the growing collection of St. Norbert stories – can be found in the online archive. Those stories are also preserved at the American Folklife Center at the Library of Congress in Washington, D.C.
Bridget Burke Ravizza (Theology & Religious Studies), who stepped in as interim director of the Cassandra Voss Center this year – the center’s director, Karlyn Crowley (English), just recently came back from a year-long sabbatical – particularly liked the idea of stories as a way to respond to some of the divisiveness we see pop up in our own circles, both in person or online. She explains that when we understand differences and see commonalities, we humanize. And when we humanize one another instead of seeing labels, we increase our empathy and positive dialogue with others from diverse backgrounds and cultures. 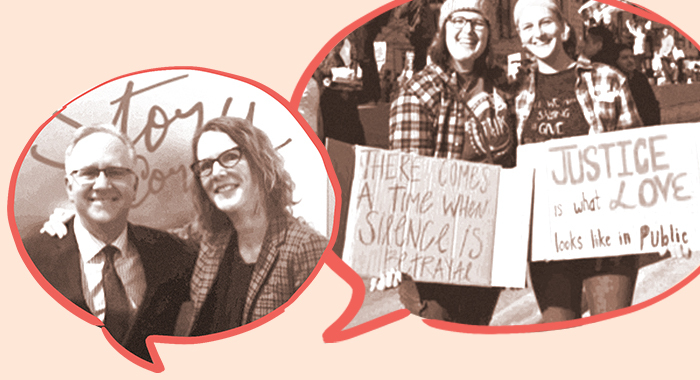 She also believes tools like StoryCorps are crucial in bringing back more thoughtful conversation and inspiring people of all kinds to share their stories in an unfiltered way. Burke Ravizza took part in the effort as well, sitting down with Kurt Voss to talk about his relationship with his daughter Cassandra ’08 – a relationship founded on love, respect and dialogue across differences. They also discussed the formation of the Cassandra Voss Center and talked about the little miracles that happened along the way, helping the center become a key part of St. Norbert College. St. Norbert’s storytelling effort culminated in a year-end showcase that highlighted the participants, their experiences and the impact of their stories, specifically through four different themes: friendship and community; hope and faith; solidarity and justice; and transformative education. This isn’t the end of the Spinning Stories campaign. Anyone from St. Norbert College’s wider community is invited to encourage others to sit down for a conversation. Readers, your stories have value! Visit the StoryCorps website for tips and resources. Record your interview and upload it from anywhere in the world. Add your story to the college's community page. One friend interviews another about her passions, her interests and why she feels listening to people talk about their own lives is so important. She also talks about how her friends and mentors at St. Norbert College helped her find a calling to support causes for marginalized and oppressed groups who don’t always have a voice. 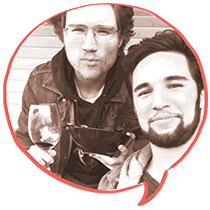 Two SNC friends share thoughtful conversation about studying philosophy, and how a knowledge of ethics connects not only to an examined life, but to career aspirations in the business of sustainable agriculture.